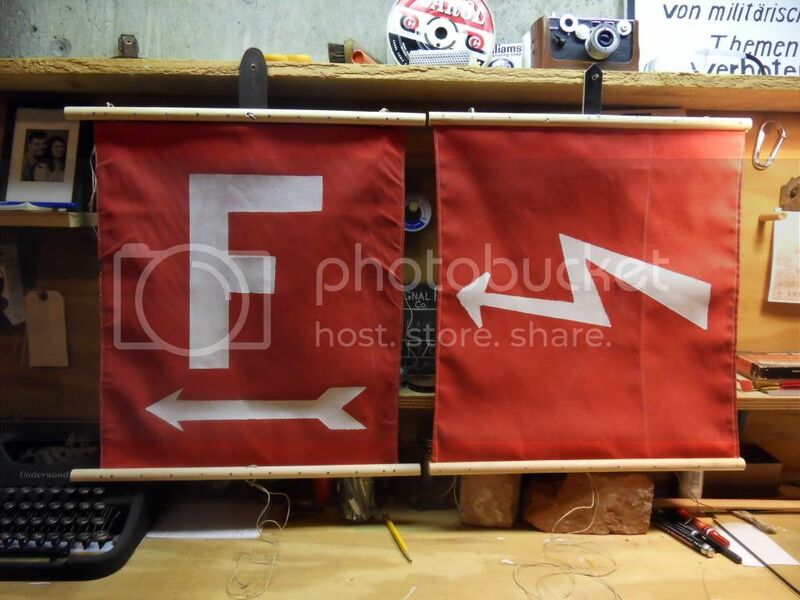 wwii axis reenactment forum • View topic - "F" and lightning bolt banners on roadsigns for Radio units? "F" and lightning bolt banners on roadsigns for Radio units? Post subject: "F" and lightning bolt banners on roadsigns for Radio units? 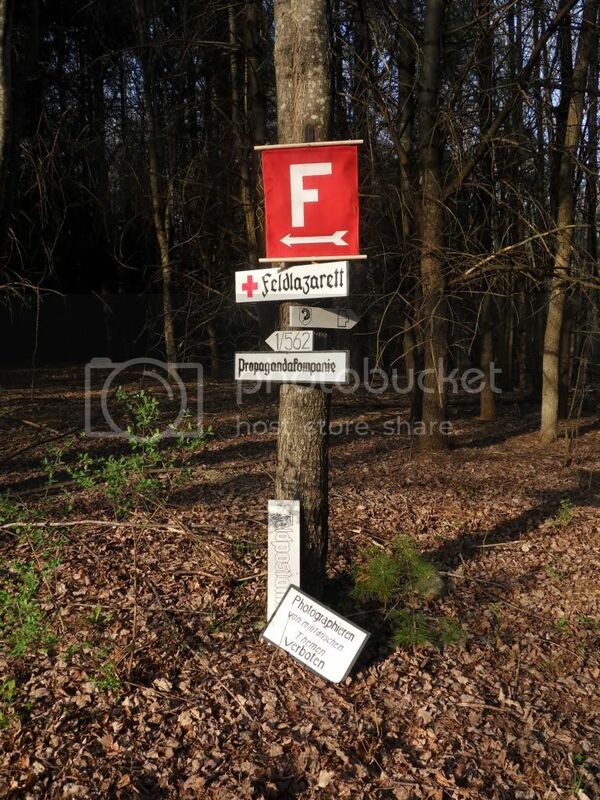 Going through a thread on another forum, i came across several photos of roadsigns and unit signs which had a banner or flag hanging on them. one poster mentioned that the flag was red, and it features a white "F" on it, an arrow indicating direction, and often smaller letters such as "T" and "K." they said it stood for funk, fernsprecher, or fernschreiben, communications equipment, and the smaller letters may indicate a frequency or code. well and good, can anyone back that up? some photos also feature another flag, with a sideways lightning-bolt with an arrow point, seeming to indicate the direction of the respective unit. what unit used these lightning bolt flags, what color were they, who used the "F" flags, and what is the difference? and while i am asking so many questions, would anyone be interested in repros of them? they don't seem too hard to make if i can get enough info about them. dimensions would be greatly appreciated. i've googled and couldn't find any helpful info. They were used to denote signals positions. These could range from a standortfunkstelle to an FF33 on a pole. There were red cloth with a white symbol. The top and bottom have a dowel rod split in half and the cloth sandwiched between them. Post war ones are the same, save they lack the arrow and the bottom the the white letter is made of reflective plastic material normally. Feldjager, that link is fantastic, thanks! and it led back to another post, of a similar flag with a "T" on it which i hadn't seen before. Would there be a market out there for these flags if i was to consider making some? i've only seen one repro, on an auction site, and it was hideous. Are there enough commo units out there who would want one (or even regular units who want one for a really authentic cluster of road signs)? I'm also interested in making unit signs to order (i.e. generic "Feldpostamt," "Werkstoff," "Feldlazarett," etc. as well as specific units like GD or Gebirgs or whatever, as long as you tell/show me what you want). Would anyone be interested in either of these ideas? Sorry it took me a while to post, been busy and haven't logged on in a couple weeks. I've found better info and good dimensions and description of an original since my original post, I've sold some about a year ago and the buyer was quite pleased. My signs are two-ply, double-sided outdoor-grade cotton with hand-stencilled painted markings. I'd like $55 shipped in the US for one of these, $100 shipped for two. More/better photos available if you'd like. I can also do just about any other small wooden unit-specific sign such as in the photos on my photobucket page. i.e. 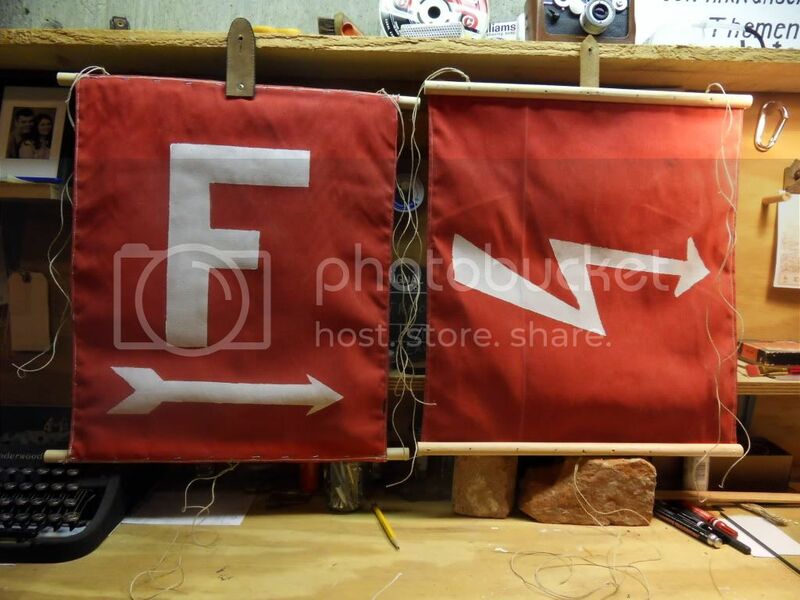 if you are portraying a divisional signals unit, I could make a sign with your divisional symbol and the appropriate tactical symbol for your signal unit. I'd do a 25" wide one-sided lettered sign for $25, double-sided for $35, or a smaller symbol-only sign for about $20. What would you like? Overseas, I'd say maybe you could make two separate payments - $50 US per flag, then I'll make it and package it and take it to UPS or FedEx or whoever and whatever they charge me to ship it, you can reimburse me in a second payment. Similar arrangement if you wanted a painted sign. Does that seem fair?